Antana has carried out the building renovation of an old industrial property in Madrid. This property is a bus station and a garage with an operational area of 2,500 m2. The project took three months and the budget was €750,000. This project required the reconstruction of structural elements and the replacement of the whole sanitary network, including the rain water collection system from the adjoining premises and the underground connection to the municipal waste water pipe. The property had a skylight that, due to humidity, was completely ruined. As such, it was demolished and then rebuilt with a metal joist structure 5 m in length, with IPE 220 sheet profiles every two metres and corrugated metal sheeting fixed to these. The beams were welded to mixed, existing beams of the building, in accordance with current NTE and CTE laws. After the reconstruction of the corrugated metal sheeting, waterproofing was carried out. 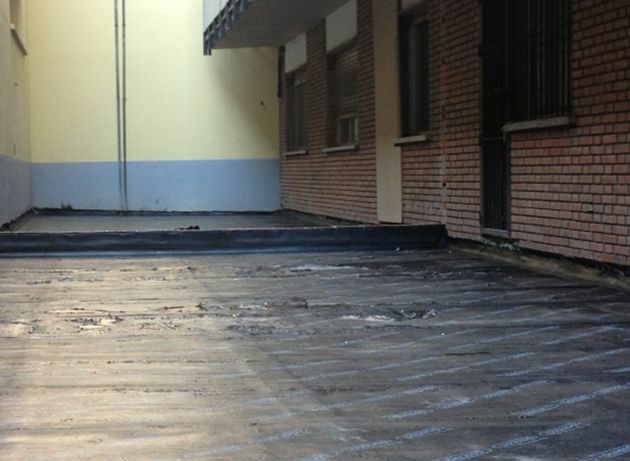 We applied a mastic asphalt coating of 200 gr/m2, on top of one coat of asphalt primer. This was later covered by protective mortar. We then proceeded to finish the corrugated sheet metal works by tiling it with Catalan tiles (each one 20 cm x 20 cm). Where these tiles meet with the vertical surfaces, we created a skirting board using the same material. We also renovated the rest of the existing metal structure as it had deteriorated due to humidity. We then proceeded to clean the building with silica sand to eliminate rusting on features and then we applied an epoxy resin to avoid future corrosion. Once this had been completed, we performed fireproofing works by applying a layer of fireproof mortar of varying thickness according to the size of each individual element. Finally, we carried out some interior finishes, as the vertical and horizontal surfaces had been extremely affected by humidity. Said surfaces were chipped down to the brickwork and then a corrugated sheet and a layer of white screed mortar were applied to the vertical surfaces, while the horizontal surfaces were plastered. Finally, we finished with two coats of protective paint. Would you like to find out about other building restoration projects Antana has carried out? You will find information, plans and photographs.